You might remember this pile of beads and cord I pulled a few days ago (if not, there's another post here with some other bracelets I made from it), in one of my favorite colors schemes: beach. It has some pretty turquoise colors all the way through teal with a few bluish greens and greenish blues thrown in, as well as ecru, tan, brown and bronze. A few howlite critters (fish and starfish) add to the fun. 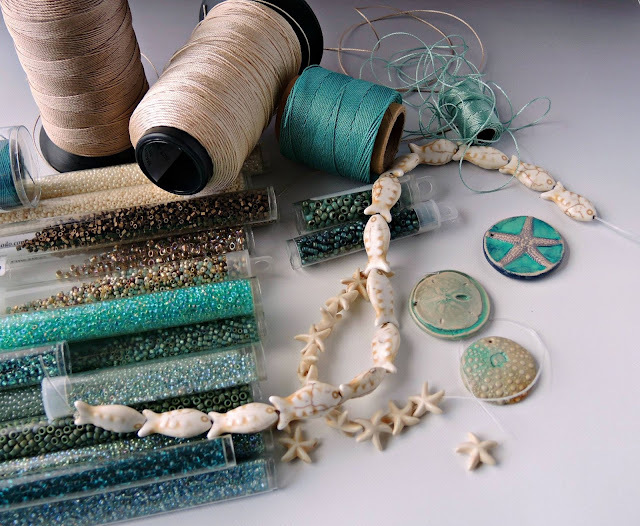 I decided I'd start a Starfish collection in these colors, adding a little starfish charm to the end of the extender chains on each of the micro macrame bracelets. For first one, I used in two colors of turquoise cord with some ecru, and beads in brown and turquoise. The beads on the edges have a pretty shimmery finish and really draw attention to the floral outline of the pattern (it's my Hydrangeas Pattern, if you want to try it for yourself). I really like the summery feel of this one. Even the back of it is pretty. For the next bracelet, I wanted to tone down the palette. I wanted really soft, understated colors so I used all tan cord with brown and turquoise beads. And of course, there's still the little starfish on the extender chain. I have a third macrame bracelet started in these colors, but I added in a new color (I know, shame on me - it's not in the palette!). It's a new Toho hybrid bead (Toho beads with Czech finishes) in Fiesta. That just sounds pretty, doesn't it! I'll be sure to show you a photo when I've finished the piece, but for now, I'll leave you with these two. I love the colors and the feel of the beach. I am looking forward to the third bracelet in the Starfish Series. Beautiful.